Kembrew McLeod has built one hell of a career. When he’s not shaping minds as the “RoboProfessor” at the University of Iowa, Kembrew is penning bestsellers, producing award-winning documentaries, and sharing his insights on music and culture in Rolling Stone and The New York Times. He also makes the kind of connections most of us can only dream about. During today’s conversation, Kembrew reveals how rebelling against cultural norms helped him build valuable relationships and forge an incredible career. He also talks about why he loves engaging in media hijinks, shows us how to make cool things happen with limited resources, and describes how a great prank can change history. 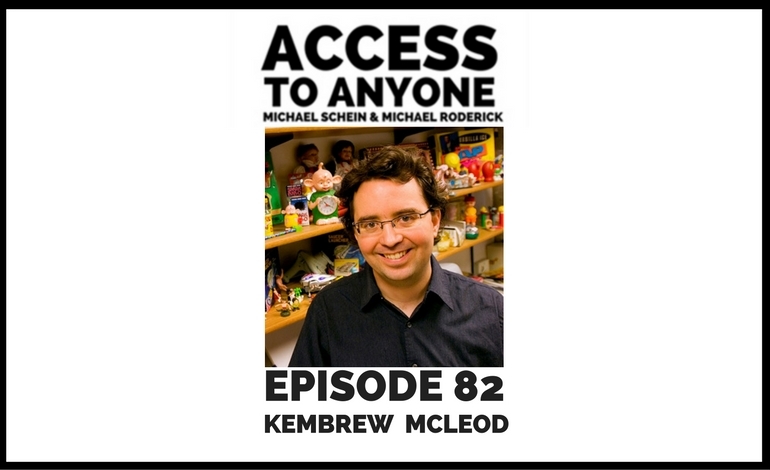 Kembrew McLeod is a Professor of Communication Studies at the University of Iowa and an independent documentary producer. A prolific author and filmmaker, he has written and produced several books and documentaries that focus on popular music, independent media and copyright law. He co-produced the documentary Copyright Criminals, which premiered at the 2009 Toronto International Film Festival and aired in 2010 on PBS’s Emmy Award-winning documentary series, Independent Lens. His first documentary, Money For Nothing, was programmed at the 2002 South by Southwest Film Festival and the 2002 New England Film and Video Festival where it received the Rosa Luxemburg Award for Social Consciousness. Kembrew’s second documentary, Freedom of Expression®: Resistance and Repression in the Age of Intellectual Property, was distributed by the Media Education Foundation—where he also worked as an educational documentary producer. Freedom of Expression® serves as a companion to his book of the same name, which won the American Library Association’s Oboler book award for “best scholarship in the area of intellectual freedom” in 2006. McLeod co-authored the book Creative License: The Law and Culture of Digital Sampling and the anthology Cutting Across Media: Appropriation Art, Interventionist Collage and Copyright Law, both published by Duke University Press in 2011. Most recently, New York University Press published his book Pranksters: Making Mischief in the Modern World on April 1, 2014. McLeod’s music and cultural criticism have appeared in Rolling Stone, SPIN, Slate, MOJO, New York Times, Los Angeles Times, Washington Post, Village Voice, and The New Rolling Stone Album Guide.